This specification defines various scoping/encapsulation mechanisms for CSS, including scoped styles and the @scope rule, Shadow DOM selectors, and page/region-based styling. CSS is a language for describing the rendering of structured documents (such as HTML and XML) on screen, on paper, in speech, etc. The selector of the scoped style rule is restricted to match only elements within scope. See Scoped Selectors in [SELECTORS4]. The cascade prioritizes scoped rules over unscoped ones, regardless of specificity. See Cascading by Scope in [CSS3CASCADE]. Style rules can be scoped using constructs defined in the document language or using the @scope rule in CSS. where the elements matched by the <selector> are scoping roots for the style rules in <stylesheet>, and selectors of style rules scoped by @scope are scope-contained to their scoping root. This rule makes it very easy for authors to create scoped style sheets, which could affect the optimization strategies for implementing scoped styles. If multiple elements match the <selector>, the <stylesheet> is effectively duplicated and scoped independently to each one. Authors should avoid using overly-generic selectors as it can have confusing interactions with the cascade. @scope rules can be nested. In this case, just as with the nested style rules, the selector of an outer @scope scope-contains the selector of the inner one. The specificity of selectors inside the @scope rule is calculated locally: the selector specifying the scoping element is ignored. However, because scoped styles override non-scoped styles, style rules inside the @scope will override rules outside of it. If multiple @scope rules apply to an element, should they be cascaded by specificity? In a scoped stylesheet, the :scope pseudo-class, defined in [SELECTORS4], matches the scoping root. This would be defined similarly to :host-context(), but matching the ancestors of the scoping root instead. However, since for scoped stylesheets you may want the ability to match complex selectors against the outside tree, rather than a single compound selector, we may want to instead use a more general mechanism that doesn’t syntactically invert the order of tree elements. This functionality would replace @global, which is a poor excuse for a selector. The Shadow DOM spec augments the DOM with several new concepts, several of which are relevant to CSS. A shadow tree is a document fragment that can be attached to any element in the DOM. The root of the shadow tree is a shadow root, a non-element node which is associated with a shadow host. An element can have any number of shadow trees, which are ordered by creation time. The most recently-created shadow tree on an element is the active shadow tree for that element. An element with a shadow tree is a shadow host. It is the host element for its shadow trees. The descendants of a shadow host must not generate boxes in the formatting tree. Instead, the contents of the active shadow tree generate boxes as if they were the contents of the element instead. In several instances in shadow DOM, elements don’t have element parents (instead, they may have a shadow root as parent, or something else). An element without a parent, or whose parent is not an element, is called a top-level element. While the children of a shadow host do not generate boxes normally, they can be explicitly pulled into a shadow tree and forced to render normally. This is done by assigning the elements to a distribution list. An element with a distribution list is an insertion point. This specification does not define how to assign elements to a distribution list, instead leaving that to the Shadow DOM spec. At the time this spec is written, however, only content elements in a shadow tree can have distribution lists. Elements in the element tree additionally have zero or more shadow trees and zero or one distribution lists. Note: The "descendants" of an element are based on the children of the element, which does not include the shadow trees or distribution lists of the element. When a selector is matched against a shadow tree, the initial selector match list is the shadow host, followed by all the top-level elements of the shadow tree and their descendants, ordered by a pre-order traversal. A shadow host is outside of the shadow trees it hosts, but it is sometimes useful to be able to style it from inside the shadow tree context. For the purpose of Selectors, a host element also appears in each of its shadow trees, with the contents of the shadow tree treated as its children. If an element has multiple shadow trees, it appears in each shadow tree’s context independently; each shadow tree sees itself as the contents of the host element, not the other shadow trees. The host element is not selectable by any means except for the :host and :host-context() pseudo-classes. That is, in this context the shadow host has no tagname, ID, classes, or attributes, and the only additional information is has is that the :host pseudo-class matches it. In particular, the host element isn’t matched by the * selector either. It would not be very good if a component used a particular class name internally in a shadow tree, and the page author using the component accidentally also used the the same class name and put it on the host element. Such a situation would result in accidental styling that is impossible for the component author to predict, and confusing for the page author to debug. However, there are still some reasonable use-cases for letting a stylesheet in a shadow tree style its host element. So, to allow this situation but prevent accidental styling, the host element appears but is completely featureless and unselectable except through :host. Shadow DOM defines a few new selectors to help select elements in useful way related to Shadow DOM. This section is still under discussion. Feedback and advice on intuitive syntax for the following functionality would be appreciated. The :host pseudo-class, when evaluated in the context of a shadow tree, matches the shadow tree’s host element. In any other context, it matches nothing. When evaluated in the context of a shadow tree, it matches the shadow tree’s host element if the host element, in its normal context, matches the selector argument. In any other context, it matches nothing. the content element it is ultimately distributed to. the element’s parent, if it has one. If an element has at least one shadow tree, the ::shadow pseudo-element matches the shadow roots themselves. In HTML, the shadow root is represented by ShadowRoot objects. The ::shadow pseudo-element must not generate boxes, unless specified otherwise in another specification. However, for the purpose of Selectors, the ::shadow pseudo-element is considered to be the root of the shadow tree, with the top-level elements in the shadow tree the direct children of the ::shadow pseudo-element. For a stylesheet in the outer document, x-foo::shadow > span matches #top, but not #not-top, because it’s not a top-level element in the shadow tree. If one wanted to target #not-top, one way to do it would be with x-foo::shadow > div > span. However, this introduces a strong dependency on the internal structure of the component; in most cases, it’s better to use the descendant combinator, like x-foo::shadow span, to select all the elements of some type in the shadow tree. If an element has multiple shadow trees, a ::shadow pseudo-element selects all of the corresponding shadow roots. Similarly, inside of a shadow tree, a selector like :host::shadow div selects the div elements in all the shadow trees on the element, not just the one containing that selector. The ::content pseudo-element matches the distribution list itself, on elements that have one. ::content is a confusingly general name for something that is specific to the projected content of a shadow tree. The ::content pseudo-element must not generate boxes, unless specified otherwise in another specification. However, for the purpose of Selectors, the ::content pseudo-element is considered to be the parent of the elements in the distribution list. For a stylesheet within the shadow tree, a selector like ::content div selects #one, #three, and #four, as they’re the elements distributed by the sole content element, but not #two. If only the top-level elements distributed the content element are desired, a child combinator can be used, like ::content > div, which will exclude #four as it’s not treated as a child of the ::content pseudo-element. Note: Note that a selector like ::content div is equivalent to *::content div, where the * selects many more elements that just the content element. However, since only the content element has a distribution list, it’s the only element that has a ::content pseudo-element as well. When a /deep/ combinator is encountered in a selector, replace every element in the selector match list with every element reachable from the original element by traversing any number of child lists or shadow trees. For a stylesheet in the outer document, the selector x-foo /deep/ span selects all three of <span> elements: #top, #not-top, and #nested. When comparing two declarations, if one of them is in a shadow tree and the other is in a document that contains that shadow tree, then for normal rules the declaration from the outer document wins, and for important rules the declaration from the shadow tree wins. When comparing two declarations, if both are in shadow trees with the same host element, then for normal rules the declaration from the shadow tree that was created most recently wins, and for important rules the declaration from the shadow tree that was created less recently wins. When calculating Order of Appearance, the tree of trees, defined by the Shadow DOM specification, is used to calculate ordering. The top-level elements of a shadow tree inherit from their host element. The elements in a distribution list inherit from the parent of the content element they are ultimately distributed to, rather than from their normal parent. Fragmented content can be styled differently based on which line, column, page, region, etc. it appears in. This is done by using an appropriate fragment pseudo-element, which allows targetting individual fragments of an element rather than the entire element. In our example, the designer wants to make text flowing into #region1 dark blue and bold. This design can be expressed as shown below. The ::region pseudo-element is followed by a p relative selector in this example. The color and font-weight declarations will apply to any fragments of paragraphs that are displayed in #region1. The following figure shows how the rendering changes if we apply this styling specific to #region1. Note how less text fits into this box now that the font-weight is bold instead of normal. Note: This feature is an extension of ::first-line styling. A ::region pseudo-element represents a relationship between a selector that matches a CSS Region, and a relative selector that matches some named flow content. This allows style declarations to be applied to fragments of named flow content flowing into particular regions. When the ::region pseudo-element is appended to a selector that matches one or more CSS Regions, this creates a 'flow fragment' selector. The flow fragment selector specifies which range of elements in the flow can be matched by the relative selector. The relative selector can match elements in the range(s) (see [DOM]) of the named flow that are displayed fully or partially in the selected region(s). Elements that are fully or partially in the flow fragment range may match the relative selector. However, the style declarations only apply to the fragment of the element that is displayed in the corresponding region(s). Either this list should be all functionally inheritable properties, or all properties. Why is it a seemingly-arbitrary subset of all properties, including box properties? 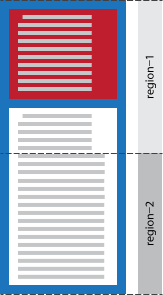 In the following example, the named flow “article-flow” flows into “region-1” and “region-2”. 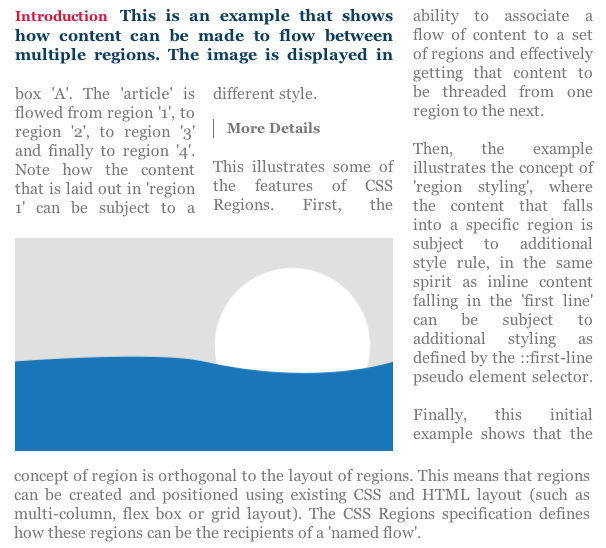 The region styling applies to flow content that fits in region-1. The relative selector matches p-1 and p-2 because these paragraphs flow into region-1. Only the fragment of p-2 that flows into region-1 is styled with the pseudo-element. All of the selectors in a ::region pseudo-element contribute to its specificity. So the specificity of the ::region pseudo-element in the example above would combine the id selector’s specificity with the specificity of the type selector, resulting in a specificity of 101. Selectors that match a given element or element fragment (as described above), participate in the CSS Cascading order as defined in [CSS21]. Region styling does not apply to nested regions. For example, if a region A receives content from a flow that contains region B, the content that flows into B does not receive the region styling specified for region A.
We’ll need some way to query the styles of a fragment in a particular region. getComputedStyle() isn’t enough, because an element can exist in multiple regions, for example, with each fragment receiving different styles.